← EN’s 12 Days of Christmas: Win a Pair of Tredstep Ireland Azzura Pro Breeches! Kevin Baumgardner kicks off the Eventing 2016-2026 USEA Summit. Photo by Jenni Autry. 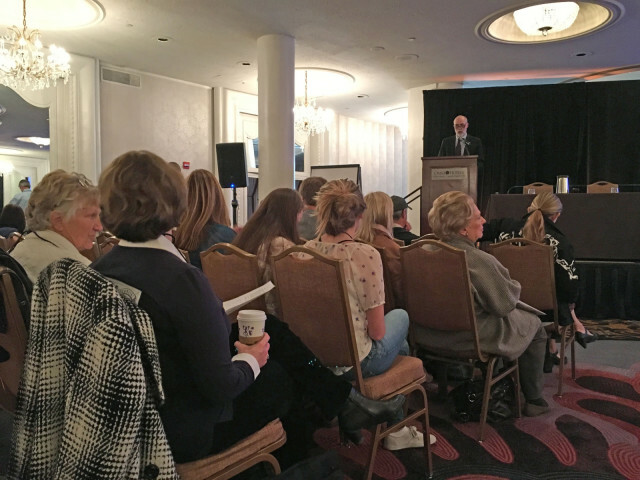 The much anticipated Eventing 2016-2026 USEA Summit and Town Hall Meeting took place Saturday morning at the USEA Annual Meeting & Convention in Washington, D.C., with lively discussion on the following topics: Eventing Costs, Membership Growth, Organizers, 21st Century Sport/Business, Calendar/Pricing, ICP/Education, Professionals and Adult Amateurs. We published live updates throughout the three hours of this meeting, so read on for a full summary of what went down. 9:10: Kevin Baumgardner, our moderator for the Summit, just kicked off things with an introduction to the format. This is going to be a three-hour process, with time for comments, brainstorming and ultimately break-out sessions to further discuss the following topics: Eventing Costs, Membership Growth, Organizers, 21st Century Sport/Business, Calendar/Pricing, ICP/Education, Professionals, Adult Amateurs. Then after the breakout sessions there will be more feedback from the audience. Here we go! 9:15: Derek di Grazia spoke first on the high cost of competing. He made the point that it’s not cheap to own a horse, and it’s also not cheap to have a horse on the road and competing. But he believes cost-saving measures can be implemented. Many events on the East Coast run over one day or two days. Further west, many events run over multiple days, and on the West Coast most events run over three days. Holding competitions over more days means higher costs, i.e. increased nights in a hotel, meals, stabling. More days away competing = higher costs, and Derek suggested having more events run over fewer days. 9:20: Brian Sabo next addressed how to grow USEA membership. Rather than trying to bring unrecognized competitors into the fold to grow membership, Brian believes that the key to growing membership is to get kids into the sport at a very young age by starting a beginner program. Working with kids also means their parents become an active part of the sport. Those are the people who ultimately go on to volunteer, train to become officials and ultimately sit on committees, which is all key for the growth of the sport in the U.S.
9:30: Wendy Wergeles, Jane Barron and Jeffrey Ryding all spoke on behalf of the proposed Council of Event Organizers (CEO), which is seeking to provide a committee for organizers that will allow them to work together and communicate more efficiently. As Jeffrey put it: “We don’t want to compete as organizers; we want to come together as organizers.” With that in mind, the first CEO meeting will be held from 2-3 p.m. this afternoon in the Governor’s meeting room. 9:40: Howard Simpson spoke about how to make it more possible to attract lower level unrecognized competitors to recognized events. There is a proposal that a focus group should be created to facilitate with lower entry fees with reduced rules and regulations. The same idea has also been supported for the upper levels. “We believe that if low-cost divisions can be created with common sense regulations and rules, it would attract some of the competitors currently competing at recognized events,” Howard said. Unrecognized shows give competitors “a la carte choices,” much lower costs and are often held over one day. They also allow organizers to be “innovative without restriction” and require fewer volunteers while having good participation rates and being profitable. “It’s a primary source for new growth in the sport,” Rob said. 10:15: Siobhan O’Brien spoke on behalf of the adult amateurs and said many of the comments already made at the Summit today reflect the same concerns shared by the adult amateurs, like the cost of competing as well as the number of days competitions are running. She also mentioned level creep (the idea that lower level courses are becoming more difficult and less inviting) as a concern and said they would love to see more educational opportunities for volunteers (on that note, don’t forget the Volunteer Initiatives session at 4:30 p.m. this afternoon). “Adult amateurs are about enjoyment. We want to have fun.” With that in mind, the new proposed DX Eventing division, which would include a dressage test with a hybrid show jumping and cross country course, has been very popular among the adult amateurs. “It’s more cross country at a lower cost,” she said. 10:30: After a brief break, Kevin opened the floor for comments from the audience, with Malcom “Vanna White” Hook running the microphone around the room. Denis also offered a suggestion on how to show recognition and appreciation to volunteers based on Plantation Field’s model. John Nunn donates a Bit of Britain gift certificate for every horse trials at Plantation Field, and every volunteer’s name goes into a hat for the winner to be drawn. At the end of the season, every volunteer from the year is eligible for a drawing to win $1,000 to go to Rolex. 10:50: We now have breakout sessions going at the back of the room for everyone to discuss the topics that have been addressed so far this morning: Eventing Costs, Membership Growth, Organizers, 21st Century Sport/Business, Calendar/Pricing, ICP/Education, Professionals, Adult Amateurs. Lots of chatter going on right now! Stay tuned for more. 11:15: We’re just a few minutes from getting back underway with feedback from the breakout sessions. 11:20: Each table will get three minutes to explain their three best, constructive brainstorming ideas to address their topic. First up is Calendar/Pricing. 11:22: The consensus in the Calendar/Pricing group is that the calendars need to be split into the two sides of the sport, each having their own calendar. One group wants the free market with both calendars. Another requested a ranking system so existing competitions can establish their precedence in the marketplace. There was also a request to consider restructuring the calendar by areas of eventing action and activity that transcends area boundaries. 11:25: Those in the ICP/Education breakout session agreed that the “unrecognized question” is a big one, and ICP is willing to help in whatever way they can. More communication between unrecognized/recognized organizers is one suggestion on the table. Another suggestion: have a bulletin board at events with contact information for an ICP representative who is available to answer questions on use of studs, how to ride the water, what line to take, etc. That provides someone in addition to the rider rep who is there for simple questions from someone who wants a qualified opinion. Finally: Hold Event Colleges at area championships. The professionals want to continue supporting and expanding the Event Colleges in order to interact and help educate amateurs at key events, i.e. leading seminars, course walks, etc. 11:33: Ruth Bley spoke for the 21st Century Sport/Business table: “We’re in a business to provide a sport, and I think everyone need to be educated that the organizers are running a business.” Can experienced organizers help educate new organizers? Can the professionals have better business models so they can bring in new riders to the sport, work with current clients and still maintain their competitive careers? 11:35: From the Adult Amateurs table: “We want this referred to as ‘our sport,’ not ‘our hobby. '” They want to see true amateur divisions in all areas. They also want value. Sometimes you get eliminated in dressage or show jumping for “doing something that wasn’t unsafe.” Some organizers will let competitors still run cross country and some won’t. Can it be listed in the omnibus if events will allow riders in this situation to still go cross country, or can rules be reconsidered? Level creep also remains a big concern. 11:37: From the Eventing Costs table: For recognized events, the entry fee is $210. For unrecognized, it’s $90. The following things drive up the cost of recognized events: hiring officials, recognizing and rewarding the volunteers, prize money, farriers on site, ambulance costs, and USEA fees. The recommendation is to look at each of these expenses to determine if there is a way to drive the costs down or control them. 11:40: The Membership Growth table discussed how to “sell the USEA to the unrecognized competitor.” Riders who are in an area where there aren’t a lot of recognized events don’t have an incentive to join the USEA and compete in recognized competitions. A different level of membership for riders in those areas was suggested. They would also like to see a similar concept to the USDF Affiliates program. The ICP program can also facilitate more riders into membership through discounts. Another idea is to have more events offer Starter/Intro levels. If courses can be kept more inviting and straightforward at the lower levels, then riders would feel more encouraged to join and compete in recognized competitions without the fear of being eliminated. 11:42: A lot of specific concerns about individual events came out of the Organizers table. They are proposing that the Council of Event Organizers become a voice to listen to to all the concerns, come up with solutions and help get them resolved. Organizers also feel like they’re having a hard time communicating with their competitors and volunteers during the competition. Ways to help with that are email blasts (through Constant Contact or MailChimp), using the area website or their own websites (but that info needs to be in the omnibus), and getting email addresses from the USEA. The concept of a volunteer leaderboard was well supported. As Wendy Wergeles put it: “Get something done through your area or pound on the USEA to get one done through the national office. It would be great to see the volunteers get the recognition they deserve because without them we couldn’t do these competitions.” Well said! 11:47: That concludes the Summit! What do you think of the discussion, EN? Let us know in the comments below. Our moderator Kevin Baumgardner wrapped things up by saying: “We are one sport.” Let’s now work together to make eventing in the U.S. stronger and better than it’s ever been. Go Eventing.